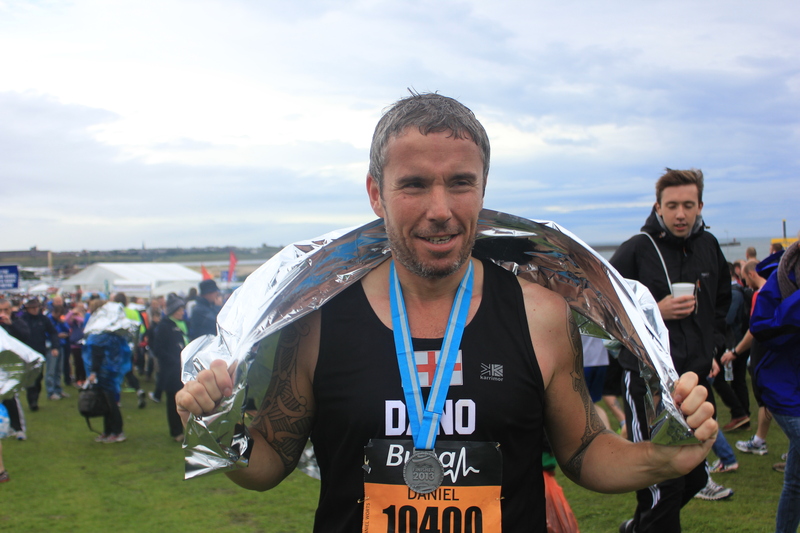 The Great North Run, the biggest half marathon in the world, was another run I just had to tick off in my fledgling running career. A regular TV event, it was only this year that I finally decided to enter. Not thinking that I would get in, due to how popular it is and being through a ballot system, I was pleasantly surprised to find out my luck was in at first attempt. My first official UK run and first half marathon since Isle of Wight last year, I was looking forward to a less painful run than a full marathon. The most painful thing about GNR was getting to Newcastle from London (a 5 hour drive as train tickets one way were over £100). 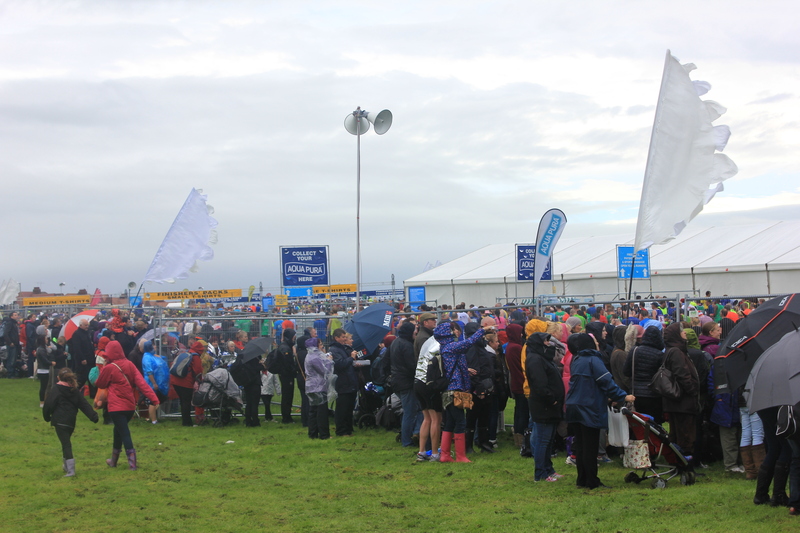 Music blared out around the starting area, with a local radio station reporting live, keeping runners updated on various information such as which celebrities were running, the weather forecast, and interviews with charity runners. The 1 km starting area had coloured pens depending on your estimated finish time. Mine was near the front in the orange pen as I had predicted my time to be 1.40-1.45. While standing in our pens a fitness instructor gave a mass workout to warm runners up. Upon crossing the start line, I high-fived Graham Swann, England cricketer, who officially started the race with Christine Ohuruogu, British Olympic athlete. Support was immediate. Crowds gathered either side and across footbridges giving runners an early boost in the wet, cold and breezy conditions. It had the atmosphere of a smaller London Marathon. Starting along a dual carriageway, scenery was non-existent. Once clear of the starting area and a few kilometres into the race crowds became more sporadic. Music and any form of entertainment was few and far between so when they did appear it was much appreciated. Race markers were in both miles and kms, the first time I had seen this, which I found quite distracting. Combined with my own GPS watch, at any given stage I could potentially be looking at three different distances and with a desired finishing time in mind, I was constantly trying to calculate how I was doing. 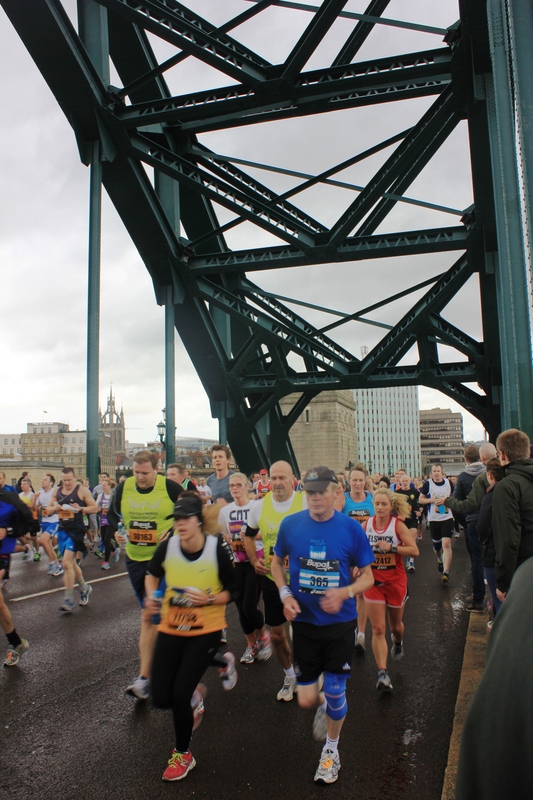 Within 3.5 km the Tyne Bridge was crossed. Crowds were deep on either side here and thankfully I saw Ro on the sidelines. The bridge was short in distance and I was on the suburban streets of Gateshead before I knew it. Unfortunately the scenery, crowds and miserable weather did nothing to spur me on. With the rain falling hard it was a case of head down and get to South Shields as soon as possible. Surprisingly hilly, with low gradient roads throughout the course, it was tougher than I had anticipated. However my training had been good and I was never in any real pain or felt tired throughout the race. With no major sights to see unfortunately, this race, as big and as popular as it is, had to be one of the dullest I had run. A passing of the odd celebrity gave me a slight lift but nothing else. Water stations were pitched at 3, 5, 6, 8, and 11.5 miles with one even giving out lager as a refreshment. I declined. The last 2 km was undulating. The sea could be seen in the distance as we ran up a fairly long low gradient hill. Closer to the finish crowds were as large and noisy as at the starting area. Coming downhill and a left turn brought runners onto the sea front at South Shields. In good weather I could imagine it to be a lovely finish however, on this day, it was cold, wet and windy. A music bus was parked up with people cheering and the 800 metres then 400 metres markers seemed to take forever to pass. A nice touch was within the last 200 meters – as the finish approached soldiers lined up clapping runners. I found this very uplifting and nearly saluted as I ran past. The finish line was a swift turn to the right and onto grass. After ten more yards it was reached. On crossing I was pleased to see I had beaten my PB by 4 mins, with a time of 1.43. Finishing 5105 out of 55,000 was something I never expected so I was very happy. Goodie bags were given out with the medal inside, in a small clear wrapper, which I felt for all the hard work from the runners was a bit disappointing. So the Great North Run was accomplished with an overall feeling of yes, I have achieved it but no, I will probably not do it again. It was a decent race, well organised, fairly hilly but if the weather is bad it’s a grim affair. Post-race tip – head to the Morrisons supermarket cafe on Ocean Rd, close to the finish area, for a cheap, yummy recovery fry-up while the crowd disperses. Hopefully by the time you finish, the train out of South Shields back to the city centre will be less packed.